A large earthquake (magnitude 7.3 according to the U.S. Geological Survey) struck the Russian Altai on 27 September 2003. This earthquake was the largest in the region since the earthquake of 20 December 1761, which is thought to have had a magnitude of approximately 7.7. A large landslide occurred on the north-facing slope (2000-2200 m ASL) of the Taldura valley after the 2003 earthquake (Fig. 12), forming a landslide scar along the boundary between the larch forest and the steppes. The wide, length, thickness and volume of the landslide mass were 800 m, 1000 m, 50 m and 35000000 m3, respectively. The permafrost, approximately 30-40 m thick, was widely exposed on the landslide scar (Fig. 12b). We did not observe permafrost in the landslide mass, which covered the steppe, but we identified fossil ice-wedge polygons on the landslide mass (Fig. 12c). 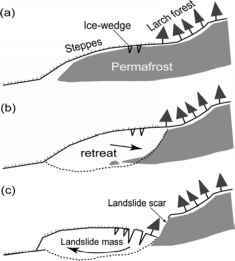 The fossil ice-wedge polygons imply permafrost occurrence not only in the larch forest slope but also in the landslide mass in the past. Figure. 12 Landslide in the Taldura valley at 2000 to 2200 m ASL. 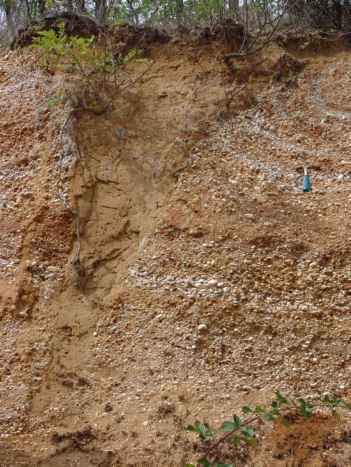 The upper half of the landslide (a). Permafrost exposure on the landslide scar (b). Fossil ice-wedge polygon on the landslide mass (c). Figure. 13 Schematic diagrams of landslides in the Taldura valley. Before the onset of climate warming (a). Duration of climate warming (b). After the earthquake of 27 September 2003 (c). 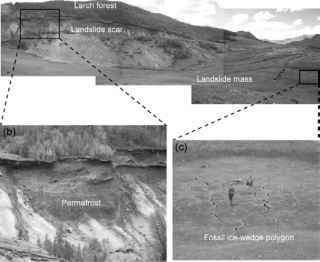 Because the landslide was located near the lower limit of discontinuous permafrost, the following processes may have led to this landslide (Fig. 13). First, permafrost existed not only in the larch forest slope but also in the steppe slope before the onset of atmospheric climate warming. The ice-wedge polygons had developed on the steppe slope. Second, because the permafrost had thawed in the steppe slope due to recent atmospheric climate warming, the steppe slope became unstable. Third, the steppe slope slipped downward after the earthquake of 27 September 2003. In the Akkol valley, a pingo ice core was exposed and had retreated; the debris above the ice core slumped to the foot of the ice scarp (Fig. 14), a phenomenon we refer to as "pingo thaw slump". 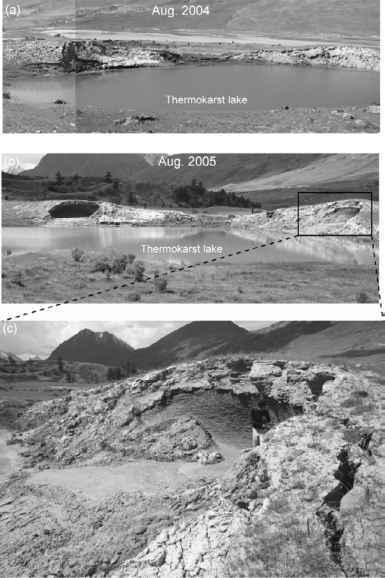 We found this phenomenon around the thermokarst lake and observed two pingo thaw slumps in August 2004 and two more in August 2005. Figure. 14 Pingo thaw slumps in the Akkol valley. August 2004 (a). August 2005 (b). Ice core and thawed materials of the pingo in August 2005 (c). We consider four processes to be involved in pingo thaw slump: sliding of the active layer, thermal erosion on the exposed ice scarp face, slumping of thawed debris from above the ice scarp face, and the flowing of thawed materials into the thermokarst lake. This phenomenon caused one pingo to nearly disappear in only 2 years. Such pingo degradation is much more rapid than the pingo decay observed in other permafrost regions (e.g., Mackay, 1973, 1990). The occurrences of these phenomena may imply a remarkable rising of the lower limit of permafrost in the study area.